We value our customers. We may collect information about you through our website in an effort to improve your shopping experience, as well as to communicate with you about our products, services and promotions. We may also communicate with you about products, services and promotions for our other online stores including ryos.co.nz. We do not sell or rent your personal information to third parties. We may ask for personal information about you, such as your name, email address, postal address, phone number and credit card number. 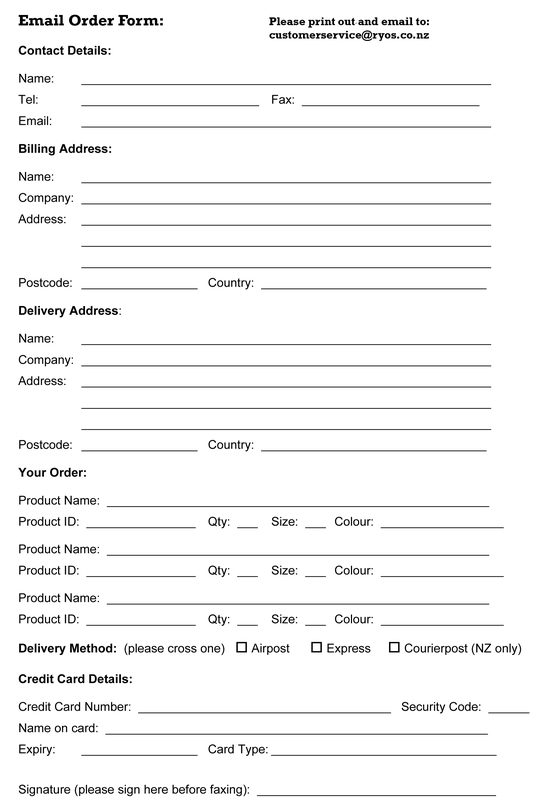 To process and fulfil your order (including sending you emails confirming the status or shipment of your order). If you have an account with us you can edit your personal information in your account profile by signing into your account using your email address and password. We limit the number of employees that have access to the databases that contain personal data. We do not store credit card information with your registered online profile. What are Secure Sockets Layers (SSL)? When you enter your personal information on our website we use Secure Sockets Layer (SSL) technology to protect your information as it is transmitted to us. When an online retailer uses SSL technology at the checkout, your PC encrypts everything that you enter into your computer, such as credit card details, billing and delivery address. To make sure you are accessing our secure server before you submit personal and financial information, look at the lower left-hand corner of your browser. If you see an unbroken key or a closed lock then the SSL is active. The CIC code was introduced by various credit card issuing organizations in order to help protect against credit card fraud in automated transactions like e-commerce. A person placing an order could give stolen or pirated credit card information that was fraudulently obtained. CIC code is intended to reduce this type of credit card abuse. The CIC code is a series of digits generated by the card issuer. The digits do not appear in the card's magnetic strip or in the card's embossed print. The digits are printed on the card using standard printing technologies that are intended to be read only. The CIC code is not printed by the merchant, on invoices, receipts or on any other document that could be embezzled. Thus, banks will not print the CIC code on any customer statement. By entering your CIC identification code, a merchant accepting payment can be better assured that the customer is actually in possession of the card. However, this does not guarantee that the customer is actually the owner of the card. If for any reason you do not feel safe entering your credit card information online, please contact us for an alternative method, or use our email order page. You can set your browser not to accept cookies or to notify you when you are sent a cookie, giving you the opportunity to decide whether or not to accept it. However if you do not accept cookies, you will not be able to access your account information or make purchases on our website.